Iming belt kit with a water pump. OEM quality GMB bearings High-temp seals, and GMB belt, and. Oct 1988 - Nov 1997 2.8L, 4 cyl, SOHC, Diesel, LN106R, EngCode: 3L. Oct 1988 - Dec 1997 2.8L, 4 cyl, SOHC, Diesel, LN111R, EngCode: 3L Aug 1989 - Aug 1991 2.4L, 4 cyl, 8V, SOHC, Diesel, LN85R, EngCode: 2L Sep 1991 - Nov 1997 2.8L, 4 cyl, SOHC, Diesel, LN86R, EngCode: 3L. All parts should be fitted by a professional and fitted to vehicle specifications. 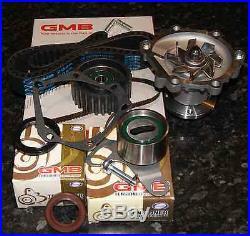 The item "Timing Belt & GMB Water Pump Kit Hilux LN86 LN106 LN111 2.8L 3L Eng 1988-1997" is in sale since Saturday, May 16, 2015. This item is in the category "Vehicle Parts & Accessories\Car & Truck Parts\Engines, Components\Timing Components". The seller is "bearings_and_engineering" and is located in Hemmant, QLD. This item can be shipped worldwide.